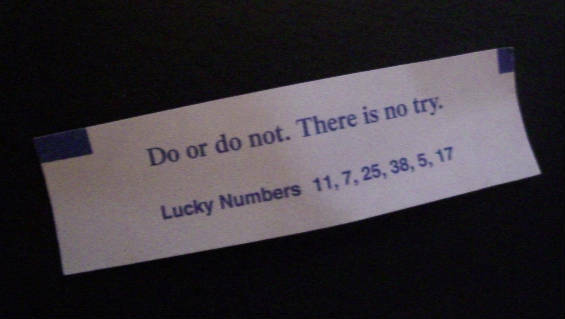 Many years ago, my mother got a fortune cookie that said, "You got the wrong cookie!" That particular message has cropped a couple of times since then. Americans crack open so many fortune cookies that it keeps the industry busy coming up with sayings, pithy or not, to make us think, laugh, or even cringe. After collecting quite a few to show you, I wanted one that would make no sense at all as the first cookie, and I found the perfect image at My 2 Second Shelf Life. 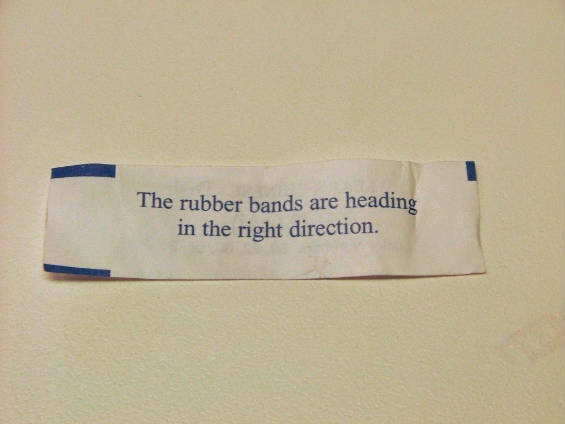 The origin of the fortune cookie is a matter of some dispute. One story is that the first fortune cookies were made by Chinese immigrant David Jung, founder of the Hong Kong Noodle Company in Los Angeles. 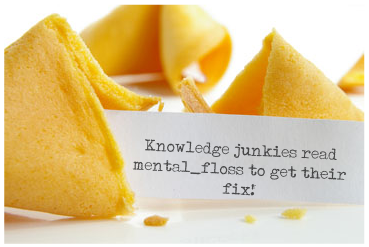 Jung's first fortune cookies were supposedly made in 1918. The other origin story is that the cookie is a version of the Japanese rice cookie tsujiura sembei, which became a fortune cookie when Makoto Hagiwara, owner of the Japanese Tea Garden in San Francisco, tucked thank you notes inside to serve his customers after dinner, beginning in 1914. He also made his cookie recipe sweeter for American palates. However, it turns out that cookies with paper slips inside were available in Japan even earlier. Logic is not necessary. Don't gamble, but here's your numbers! This picture (and the next) is from a collection at Top Cultured. At least two companies have tried to sell fortune cookies in China, but both have failed as the concept is very strange to the intended market. 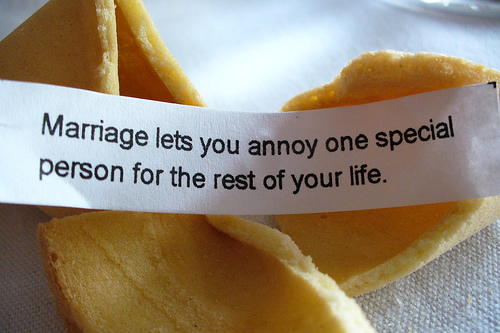 Only a couple weeks ago, Matt Soniak gave us instructions for proposing marriage to your sweetheart by fortune cookie. 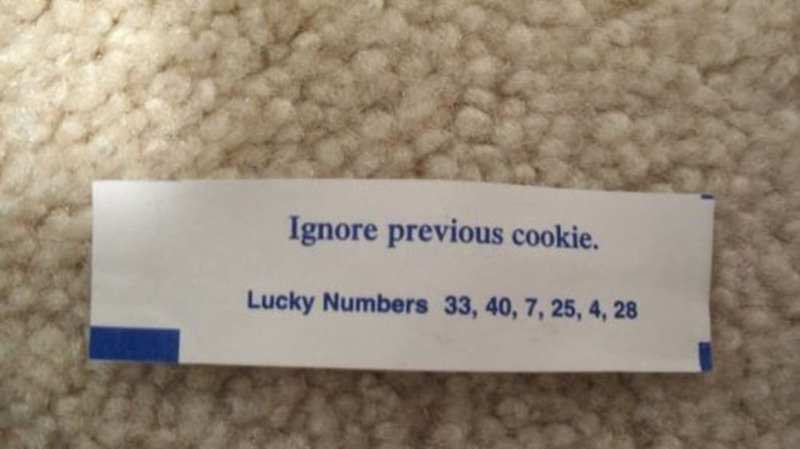 If you don't feel comfortable making your own fortune, there are companies who will make cookies with custom messages by mail order for a price. Since there is a minimum run of cookies, these are popularly used for birthday parties or weddings. 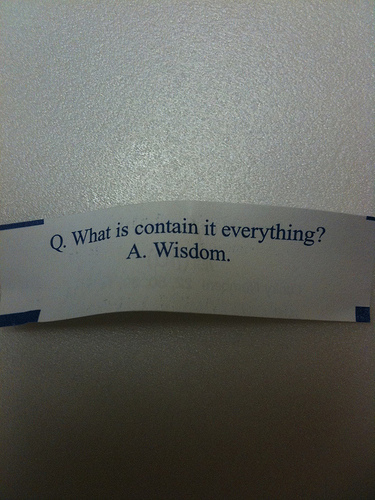 If you received this fortune cookie, you might be tempted to question your own sanity -or the dinner you just consumed. It was posted by redditor bryght. Is it an omen? A lazy writer? Or possibly a misaligned paper cutter? 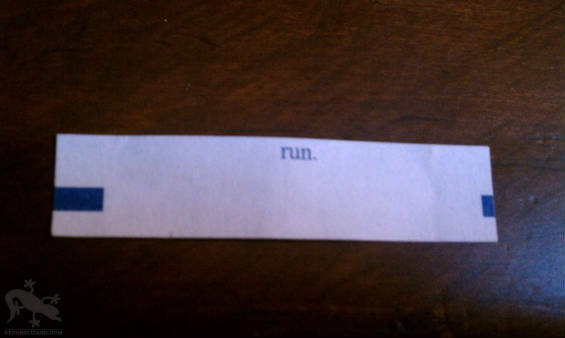 This fortune, posted by redditor othersomethings seems complete and deliberate, but could be the result of drug use in the copy room. Or just plain confusion. 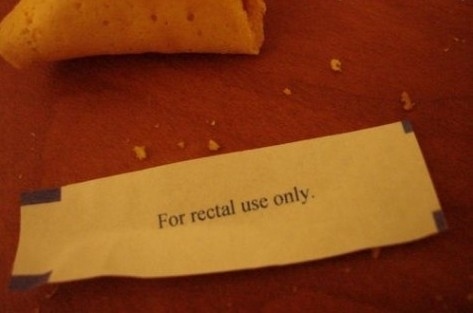 Fortune cookie manufacturers take feedback from their customers seriously. Bernard Chow at Wonton Food said customers asked for more contemporary and predictive fortunes, but the depressing results of the effort got the company written up in the New York Times a few years ago. The tone of the fortunes was adjusted accordingly, at least for that particular manufacturer. Corinna received these two depressing fortunes just this year. 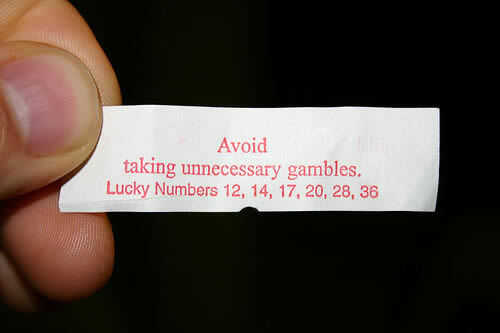 Have you ever aspired to be a fortune cookie writer? 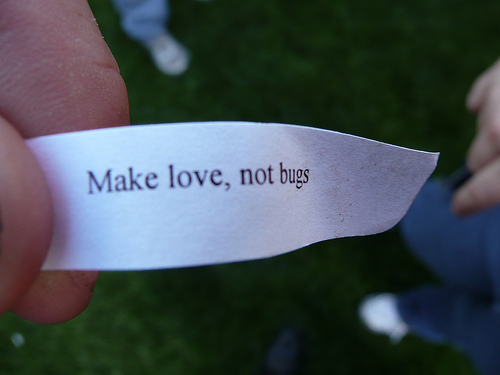 Most of us who ever received a lame fortune have contemplated it for a short time. However, there aren’t many of these positions available. Donald Lau is the vice-president of Wonton Food, Inc. in Queens, New York. In addition to his financial work, he has written many cookie fortunes. Other manufacturers appear to depend on fortune writers who don't speak English. These fortunes are great for a laugh! Nice, but it would make more sense if you put the words through a blender again. Which is more than you can say about this one. There's no danger that I will make any bugs. I'm no programmer. Some are copied from text found elsewhere, but edited to fit in the space allowed. Or copied verbatim in its entirety, from any random source of English. See the rest of this collection at Buzzfeed. But every once in a while, you encounter a cookie from a comedian in training. A few years ago, Bob Bjarke received a cookie that impressed him so much that he created an entire website to honor it. Four years later, people still go there to receive inspiration for their aspirations. The inspiration for this one is obvious. Not much in the way of enlightenment, but if I got it, I'd take a picture of it, too. 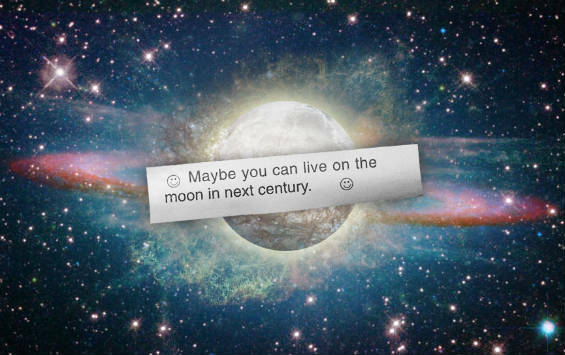 Some online generators will give you a random fortune any time you want one. That's especially handy if you don't like to eat the cookies. Others allow you to write your own, and save the image. 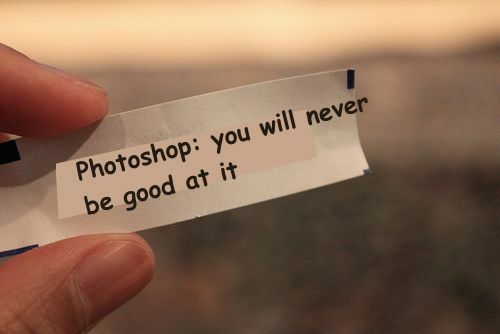 That's the easy way to do it, but if you have any image manipulation skills, you can add your own message to almost any picture of a fortune cookie, so take images on the internet with a grain of salt. 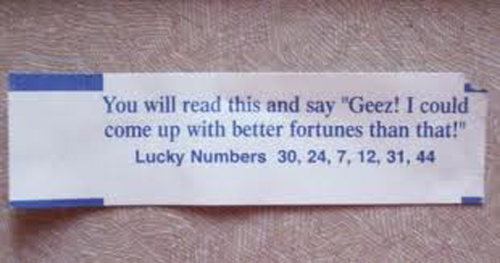 A fortune cookie doesn't have to be real to be entertaining! This one was posted by redditor other_one. They can even be works of art. 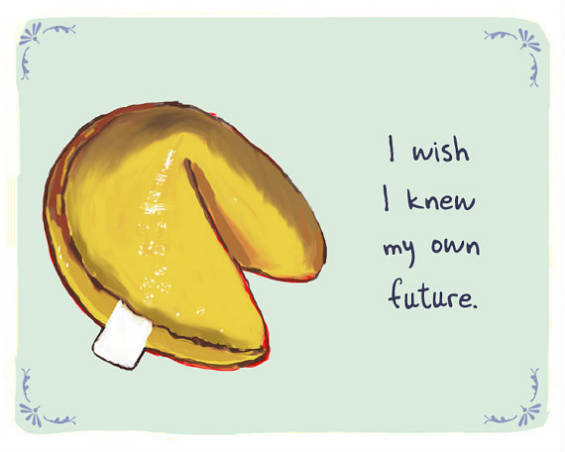 Artist Christopher Rozzi painted the secret thoughts of a fortune cookie for his series Tiny Confessions. The print is for sale at his Etsy store. How about you? 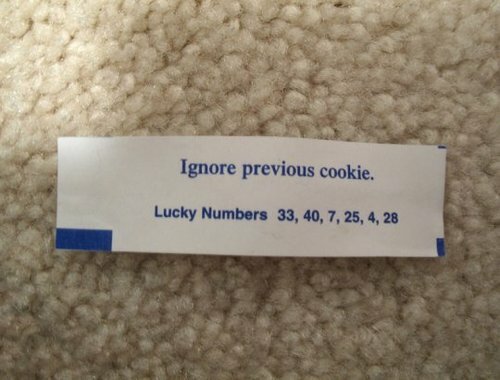 What the strangest fortune you ever found in a cookie?